I am one of those people who swear by oatmeal for breakfast. Sure there are other breakfast options out there, but none are as creamy and satisfying as a warm bowl of oats. For years I tweaked my morning bowl, from peanut butter and jelly oatmeal to maple, walnut and raisin oatmeal and pumpkin pie oatmeal. There was one common theme though, sugar. Like most people I was stuck in the sweet oatmeal rut. As delicious as it was, I wanted to try something new. My first attempt was egg, cheese and peanut butter oats but after making peanut butter chili, I found a new favorite ingredient: hominy. It’s not all that strange when you think about it – grits are just ground up hominy, so this is like combining two breakfast grains only better because of the outstanding texture of hominy. 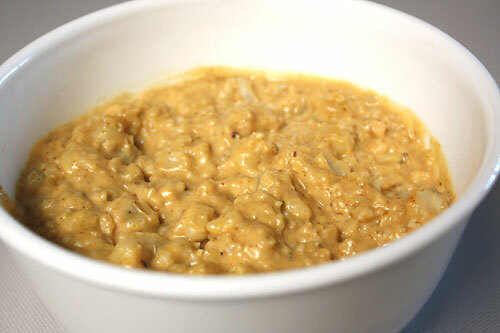 I’ve never had such creamy oatmeal, making this one a new favorite. Even the heat outside doesn’t deter me from this hot and spicy breakfast. Oh, how sweet it isn’t! 1. Combine milk and oats in a microwave safe bowl. Microwave on high for 2 minutes. Add hominy and microwave for 1 more minute. Stir in peanut butter, hot sauce, salt and pepper. If too thick, add milk to reach desired consistency. If too thin, add PB2 to thicken. I tried hominy this past halloween and it was great! I love the texture of it and I’m sure it would be amazing in oatmeal…plus the spicyness? Perfection. Hominy is a great idea. I’ve only cooked with it in posole, but I bet it’d be a great addition to oatmeal. Really, there isn’t a grain that doesn’t pair well with oatmeal. Am intrigued by the spiciness! But what is hominy? Mmm, this sounds absolutely delicious. I love hominy. I actually have a recipe for hominy souffle! I can’t wait to try this out. OK, but be open-minded, it sounds gross but it’s actually so delicious: every week I make this giant veg roast. I make a huge batch and then eat from it all week. I throw in eggplant, zucchini, green beans, mushrooms, squash, broccoli, asparagus, tomatoes, shallots, garlic, etc, anything that tickles my fancy that week. I roast the all with generous glug of olive oil, salt and pepper. 40 min at 400F. Then I make the omelette in a giant pan, layer a bit of baby spinach, put some roasted veg in the centre along with 2 or 3 (sometimes 4) spoonfuls of the good stuff and fold the sides in, so I end up with a loaf-looking thing. OMG Nick, I’m telling you, it’s delicious!! So easy too, every day I just make the egg part, but it takes like 5 min once you have your veg. Easy to transport to the office too. I’ve had this for breakfast every day for the past 2 years and, I’m telling you, I don’t see myself getting tired of it anytime soon! Ah, you’re so right! Hominy is too neglected. I love it, but even I have to admit that I hadn’t thought of it in years until I read this post! My mom used to make southern-style casseroles with hominy and it is some solid comfort food. Interesting oats- I’m pretty addicted to the sweet type, but maybe I’ll give these a shot- this would be great creamed! This is very creative, Nick. I would never have thought to put these ingredients together. Looks delicious. I like the sound of savory oats-terrific idea to mix in hominy. And I bet the spice gives it a nice little kick to get you going in the morning! Im happy that you helped me try hominy in other things! I’ve never had hominy, but it looks amazing. Thanks for sharing Nick! i picked up some hominy to try, but haven’t had a chance to use it yet. i should work on that! What a great idea! I keep meaning to pick up some hominy and give it a try–this looks like a great way to start. Looks delicious! Haha, wing sauce is one of the greatest inventions ever – except that I don’t really enjoy chicken wings, so I had to find other things to put it in. But seriously, this is my favorite breakfast of all time!